They say the sense of smell has the greatest power to evoke memories, and this may be true. I have only to get a whiff of lemon furniture polish and I’m four-and-a-half again, and entering a freshly scrubbed kindergarten for the first time. A newly opened box of Crayola crayons can take me there, too. Sight comes in a close second. However it’s not quite so instantaneous. Deciphering a visual memory can take a few seconds. I’ll show you what I mean. 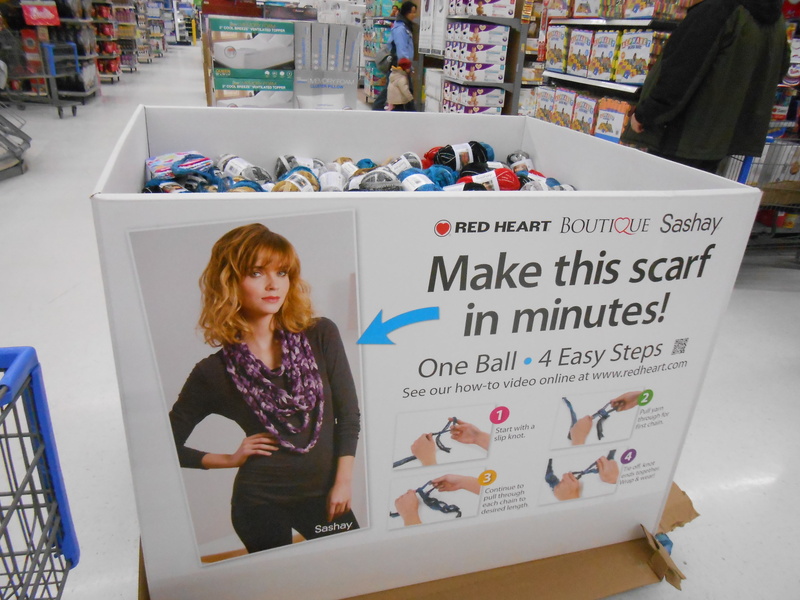 There I was, in Wal-Mart, minding my own business, on the way to buy bottled water when I walked past this display. i proceeded about 20 steps before I stopped short, a silent screaming n-o-o-o-o echoing through my brain. The dreaded pot -holder-making-monster!!!!! My mother used to go shopping on Wednesday’s, my father’s day off, and it had always been her habit to bring me back a book of some sort . Sometimes it was a story book, other times a coloring book, a connect-the-dos book, or as I got older, crossword or puzzle book with wonderful maze puzzles. I was always quite happy with these but when he got old enough, my younger brother Jimmy instructed my mother to “buy toys, not books”. So I think I’ll blame the loom on Jimmy. 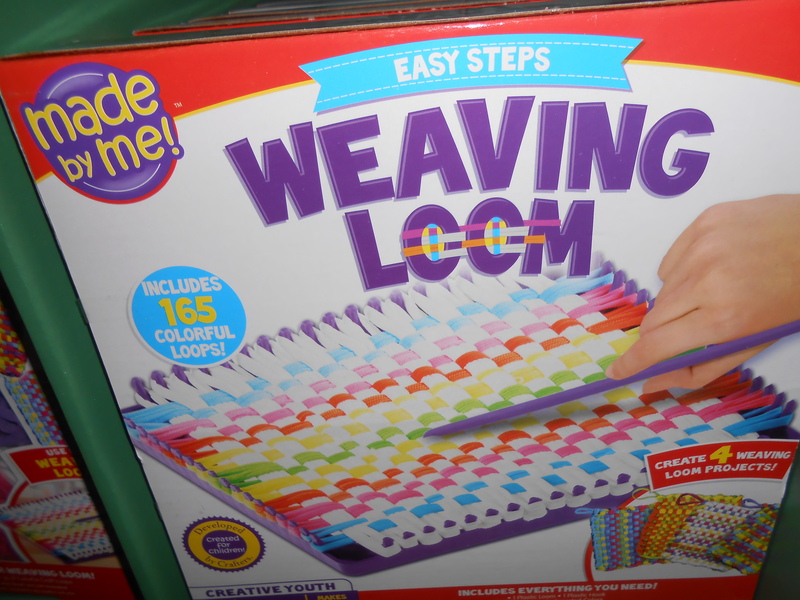 I must have been about eight when, thanks to Jimmy, my mother brought home a handy-dandy little loom kit – for me of course. Jimmy probably got a car or toy soldier. It wasn’t quite as big as the one that jolted me in the store. As I recall, there was a green metal square loom, about 8″x8″ with these serious looking “teeth” on top. Also in the box was a plastic bag of cloth loopy things, all different colors, and I guess, there must have been some sort of hook, maybe like a crochet hook. It was probably November or thereabouts because right away, my mother started me on a Christmas project , or as she put it………. Maybe she had hopes that I’d become a master crochet artisan like my grandmother. who could spin perfection while watching a movie in a darkened theater. I guess my pot holder was passable because next year “we” were starting in October, making pot holders for Aunt Edrie, Aunt Gladys, and Aunt Stell. Future years would see our downstairs neighbor Mrs. Vanderveer, who put up with the ceiling noise of three kids being kids, added to the list. Later, came Mrs, Shirley, my girl scout leader, and Mrs. Edgecombe, my piano teacher. Since everyone from previous years remained on the list, receiving a new improved (or not) pot holder, “we” were starting “our” project during the summer. Once the memory ran its course, I shook off its effects, and proceed to the beverage section, Well, maybe not quite directly. I stopped to ponder taking this on. I do live at 19 Wood……… but it’s not Woodhaven, and, as tempting as the West Indies may be with tomorrow’s forecast of single digit temps, I make my home in Putnam County NY, not Jamaica. To make it even more mind-boggling, this misplaced Christmas card had originated in Florida! Is there anyone out there who can tell me how a letter could travel 1,000+ miles in the wrong direction to the wrong country, based solely on the number 19, and a road that begins with the word Wood? 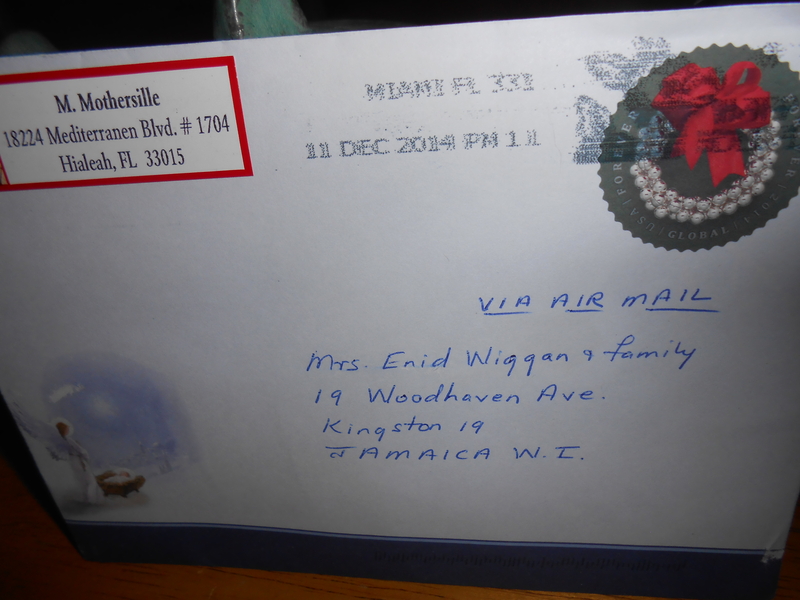 Two different people told me it means I should take a trip to Jamaica, but I did the next best thing, I put the whole thing in a new envelope and mailed it to Mrs. Ena Wiggan and her family. So far so good, it hasn’t come back!